Despite storing your documents carefully, do you always struggle to retrieve the right documents at the right time? If yes, you are perhaps not classifying those correctly. ADC interprets the meaning of the text and the context in which words are used before organizing the documents in perfect categories, ensuring easy retrievability. Give O2I’s Automatic Document Classification a try! At O2I, our document indexing services have greatly benefited our BFSI customers who are reaping the promised ROI within a short time period. Using state-of-the-art document indexing automation technology, we ensure that all your enterprise data linked to documents, reports, manuals, research papers, performance metrics, training material, etc. are easily classified and routed. Our document classification processes rely on machine learning and cognitive computing to design and develop a solution which suits our customer's requirements. The developed solution can either be hosted on an internal cloud or be deployed a as a service platform. Our services cover all phases of data science application development including data understanding, platform architecting and model building with continuous improvement cycles for better accuracy. We use the latest file classification processes which leverage advanced machine learning technology to ensure we are always up-to-date with different document types and taxonomies. Based on machine-learning, our processes always keep getting smarter by knowing your enterprise's classification and routing rules, thereby leading to greater cost reductions over time. Since we set specified confidence criteria for all our client's documents, all documents which conform to the criteria are automatically routed and indexed ensuring smoother and faster processing. Rules engine for validation process is created based on business rules shared by the client. Our file classification using machine learning further ensures that our smart processes withstand all changes made to the validation rules as soon as they are implemented. 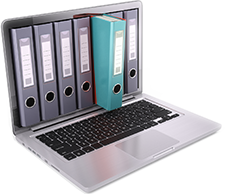 Our custom modules allow our clients to process scanned files as well as electronic PDF documents with maximum efficiency. As soon as our software detects an electronic document, the rules set up ensure that tedious and time-consuming manual processes are neglected in favor of modern text layer scanning processes which improve system performances by 80%, while achieving 90-100% accuracy for electronic documents and PDFs. Our automation solutions for document indexing and classification are cluster-based and designed to undertake high-volume data with ease. In a demanding industry where information is essential to run day-to-day business, our high availability, parallel processing solution, which requires minimum human supervision, supports automated workflow rules and generates results in very short time frame. Why Choose Outsource2india for Automatic Document Classification? O2I is one of the very few service providers who have excelled at automatic document classification services in India. We help to streamline recurring manual processes by automating them and ensure all your documentation is converted into actionable business-ready data. Armed with a team of eminent data scientists and big data engineers, we are constantly delivering high-quality document indexing solutions backed by deep analytics and machine learning. Our solutions are ideal for mid to large-sized companies faced with mounting volumes of document processing. With vast experience under our belt, O2I's document classification system leverages artificial intelligence and machine learning to create custom solutions for medium to large-scale enterprises. We can work with both text-based as well as image-based documents, ensuring our solutions are far superior to OCR technology; all the while ensuring the solutions learn new rules and sets them up as and when required. Contact us right away to understand more about our offerings. Partner with us right now!